I Love Your Presence: Vineyard Music EXTRA! You and You alone do I worship! 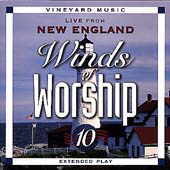 The Live from New England live worship collection reveals an intimate look at how our great God makes Himself known among His people who are willing to humble themselves in His presence. The music expressed in this Winds of Worship collection is alive with the anointing of His presence as the worshipers proclaim and rejoice in the simple truth that You are God. This ministry of music reveals the Holy Spirit moving in the hearts of His people, healing, filling, washing them, and finally bringing them to the place of worship where we meet our King and Master. Each worship leader brings his or her unique personal gift and expression of worship as an offering to the Lord. If one truly listens to this volume of music with a heart of worship, the leaders become quite invisible as it should be. My heart cannot express the Lords touch on my personal life as I experienced His presence in such power during those 3 days of worship and teaching as one who attended this life changing worship conference. Truly I say Holy is the Lord. Listen with all your heart and let Gods people humble themselves in worship!